Beth Patterson was born in a swamp. Okay, more accurately, she was born in a hospital near a swamp, but that’s close enough to romanticize the origin of this Lafayette, Louisiana native. Described by audiences as “a cross between a cobra and a puppy,” multi-instrumentalist Beth Patterson is foremost a player of the eight- and ten-stringed Irish bouzoukis (adaptations of a traditional Greek instrument). Known for her razor wit and musical versatility, her performances are chock-full of drive, savage energy, and passion, laced with humor and rapport with her listeners, dishing out an eclectic repertoire of original and traditional songs. 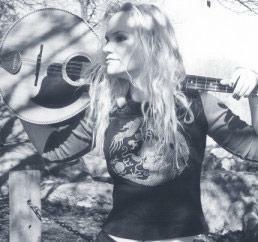 She integrates her quirky, progressive sound with Celtic music and other ethnic styles, resulting in her own sound she dubs “SWAP” (Songwriter/World/Acoustic/Progressive). This musical mongrel began her career in her early teens as a classical oboist and a Cajun bass player (with the required teenage heavy metal stint on the side), but not truly belonging to any of these, set out to create her own niche when she was adopted by a stray bouzouki. After moving to New Orleans, she began to play the circuit, initially intending to do the folky thing, but accepted gigs of all types left and right because no one told her that they shouldn’t be played on the bouzouki. (Not to mention that it was a sin.) So she tried on genres as though playing dress-up, snatching up influences like a crazy cat lady with felines…she couldn’t bear to reject a thing. Beth later fled to Ireland, studying ethnomusicology at University College Cork, where she explored the music of Ireland, West Africa, India, Indonesia, and the Caribbean, and began to experiment with fusions of these world gems with her musical old flames. This finally rendered her with the mind of a prog rocker, the heart of a world music-lover…and let’s just skip the part about her soul. So, what has this hussy actually done? Well, Ms. Patterson has released seven solo CDs and has received airplay in the every continent (Antarctica notwithstanding). She has appeared on over a hundred and sixty recordings (including the nationally-charting Change of Habit by her former band The Poor Clares). Soundtrack appearances include the motion picture The One-Eyed King (starring William Baldwin and Armand Assante), and Mike Judge's Mirimax release Extract. She’s performed in eighteen countries across the Americas, Europe, Asia, and Oceania. Various artists have recorded over a hundred of her compositions and co-writes across the US, France, Ireland, and New Zealand. She completed a bachelor’s degree in Music Therapy from Loyola University, New Orleans. But she claims that her work will not be finished until the word "bouzouki" is no longer flagged by spell-checkers worldwide. In addition to solo gigs, Beth also performs in ZoüKeys (a prog/jazz/Celtic/roots mashup duo with her husband, acclaimed pianist Josh Paxton), the Round Pegs with PH Fred, and nabs the occasional freelance bass gig. For film/TV music licensing, contact Shepard Samuels at Shepardha@aol.com.